The details are available instantly for a user seeking common laser measure functions, including area, distance, length, volume, continuous measurement and addition/subtraction. The Bosch GLM 40 stores up to 10 measurements to improve productivity. In addition, the user doesn't need a calculator to determine area or volume anymore. Handy pocket-size design that makes unit easy to use anywhere; package includes pouch, hand strap and target cards. 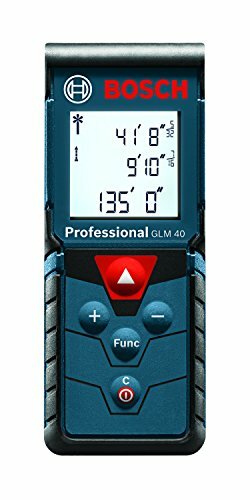 The GLM 40 measures to 135 feet. VERSATILE: The Bosch GLM 40 Laser Measure includes multiple measurement capabilities such as area, distance, length, volume, continuous measurement, addition and subtraction. Measuring distance extends up to 135 feet. MEMORY: Conveniently stores up to 10 measurements to increase productivity. Real time laser measurements adjust as the user moves closer and farther away, just like a tape measure. VISIBILITY: The Bosch GLM 40 Laser Measure features a backlit screen for better visibility and resolution in dark work areas. ACCURACY: With Bosch Laser Technology, the GLM 40 measures to within +/-1/16 in. for extreme accuracy and precision.